As we grow older, our bodies begin to go through a variety of changes. Adults over the age of 60 are most at risk for a myriad of health concerns, ranging from dietary issues, kidney health and more. One area that requires consistent attention is eye health. Annual exams are important to keep you and your vision healthy. As a top provider of home health care to Charlotte residents, Mission Medstaff is here to help people of all ages to improve their health through consistent, quality nursing services. Our 24/7 at-home care services can cover everything for your loved one, delivering professional medical services in the convenience of your own home. From pediatric services for medically fragile children to senior home care to help the elderly retain their independence, Mission Medstaff is ready to help. We are proud to be your all-inclusive in-home care providers. Today, we’ll take a look into the importance of senior eye care by discussing a few major concerns that affect older patients. If you or a loved one are in need of nurse support services, be sure to contact us today. This vision issue is actually very common, but can have serious consequences if left untreated. 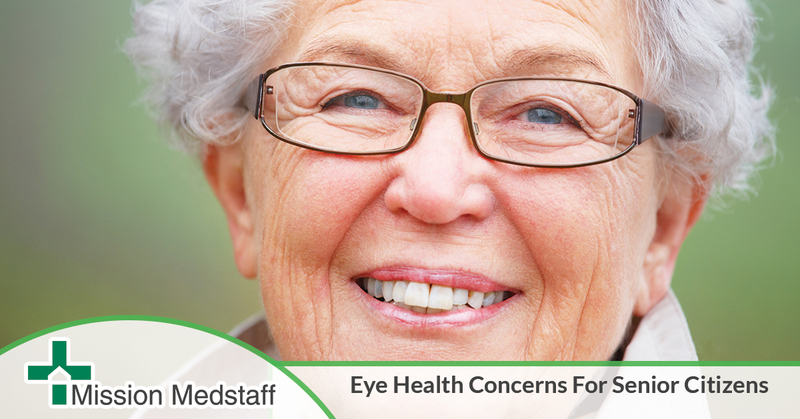 In fact, more than half of all Americans over the age of 80 have had cataract issues at one point or another. As time goes on, the lenses in your eyes become cloudy. This can be likened to looking out of your car through a foggy windshield. Cataracts can dramatically affect your quality of life, impairing your vision to the point that you may not be able to drive a car. Fortunately, modern medical advancements have made cataract surgery a common, low-risk operation. Have you ever received a puff of air directly into your eyes at the optometrist’s office? Then you have had a successful glaucoma test. This eye disease stems from an excess buildup of fluids that build up in the front part of your eye. As the pressure increases, so do the damages being inflicted on your optic nerve. Many people with glaucoma face no symptoms, leading to a gradual progression of the disease. Fortunately, modern treatments are available. These options range from eye drops to surgery. It’s important to get your glaucoma test annually, as failing to get treatment can lead to vision loss. This disease is the most common cause for vision loss amongst Americans. Statistics show that 10 million Americans are affected by macular degeneration, which is more than glaucoma and cataract cases combined. The symptom can be best described as a loss of central vision, resulting in a dark spot wherever you look. Age-related Macular Degeneration’s (AMD) cause is unknown. In younger people, the disease can be attributed to specific genetic issues. Unfortunately, there is no cure available for AMD. However, treatments are available that may slow down the progression of this disease. There are no symptoms in the early stages, necessitating the need for regular eye exams to catch any problems early. A normal and common side effect of aging is the loss of your peripheral vision. Professionals estimate that your field of vision decreases between one and three degrees every decade. While not vital to your sight, peripheral vision is very necessary for safety when operating an automobile. Elderly drivers will need to pay close attention to their eye health before hitting the open road. Regular eye exams are helpful here for determining your range of peripheral vision. Different strategies can be employed at this point to increase driver safety, but not much can be done for restorative purposes. As we age, the need for increasing medical attention becomes mandatory to ensure that everything is running smoothly. Having a team on staff to look out for your health is important, especially if you are dealing with serious ailments or surgeries. Mission Medstaff is here to provide the best home health care to Charlotte patients and beyond. For years, our home health nurses have striven to perfect our program, delivering comprehensive care for a wide range of ailments. From intensive cardiac care to diabetes management, we’re here to help everyone thrive. Contact us today to see how we can help you and your loved one on the road to recovery.